Be the first to share your favorite memory, photo or story of Zigmund. This memorial page is dedicated for family, friends and future generations to celebrate the life of their loved one. 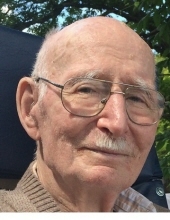 Zigmund T. Bartkowski age 99 of Oak Park, Michigan passed away on Wednesday, March 27, 2019. Beloved husband of the late Margaret for 63 years. Dearest father of Laura (Bob) Powers, Donald (Mary Kisting) Bartkowski and Janice (Jim) Lynch. Loving grandfather of Kyle and Emily Lynch and Annie, Daniel and Maggie Bartkowski. He was a veteran of World War II serving in the U.S. Army, Life long and active member of Our Lady Of LaSalette Catholic Church in Berkley, Michigan and a member of Disabled American Veterans. Visitation at Sawyer-Fuller Funeral Home 2125 Twelve Mile Road in Berkley, (two blocks west of Woodward Avenue) 4-9 pm Friday, March 29th with a scripture service at 7:30 pm. In state at Our Lady of LaSalette Catholic Church 2600 Harvard Road ( corner of Coolidge Highway) in Berkley, Saturday, March 30th from 10:30 am until time of service at 11 am. Burial at Resurrection Cemetery in Clinton Township. In lieu of flowers memorial contributions may be made to Disabled American Veterans, Society of St. Vincent De Paul or to the charity of your choice. To send flowers or a remembrance gift to the family of Zigmund T. Bartkowski, please visit our Tribute Store. "Email Address" would like to share the life celebration of Zigmund T. Bartkowski. Click on the "link" to go to share a favorite memory or leave a condolence message for the family.